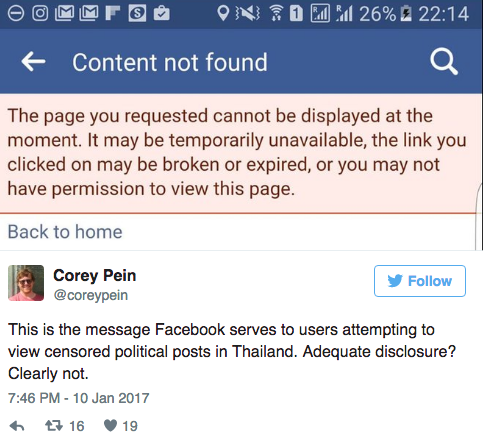 Since Facebook took down posts in Thailand of King Vajiralongkorn’s main mistress, they’ve tried to justify their actions by claiming that they’re trying to respect the laws of the country, but they’re really just supporting the government of Thailand’s extreme censorship laws. It all started on Tuesday, January 10 when journalist Andrew MacGregor Marshall realized that a few of his Facebook posts along with those of Somsak Jeamteerasakul’s (his fellow dissident) were no longer showing up for Facebook users trying to access the posts in Thailand using a Thai IP address. Marshall’s allegations were confirmed by news sources after a Thai proxy server was used to try and access the post. 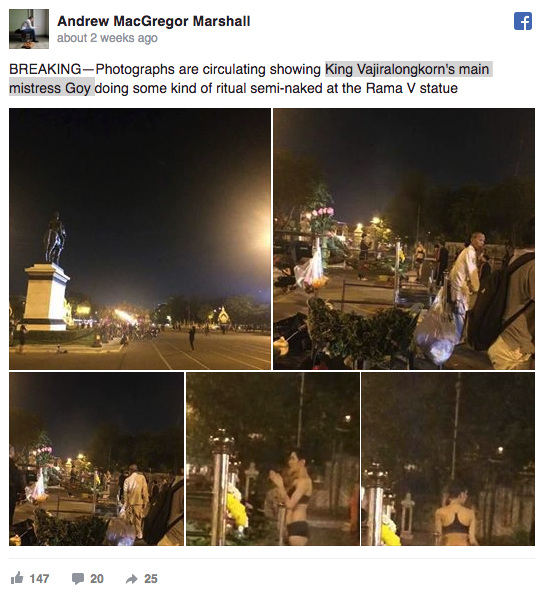 The post in question was one which featured photos of King Vajiralongkorn’s mistress Goy. The photos show the mistress in downtown Bangkok wearing nothing but her undergarments while paying her respects to the statue of the former Thai King Chulalongkorn, who died in 1910. Thailand has a set of strict ‘lese majeste’ laws which forbid anyone to speak against the royal family. Just liking anti-royal material on Facebook is enough to get someone convicted. Andrew Marshall, who was also a Reuters reporter based in Bangkok, was banned from Thailand in 2011 and now lives in Edinburgh, U.K. Marshall says that the reason he broke the ‘lese majeste’ laws was to bring light to the extreme censorship imposed on Thai people by the government. Facebook has said that it works with governments to remove posts, doing what they can to stay within the parameters of the local law, but what about the parameters of human dignity and freedom of speech? A spokesperson for the social media giant said that every flagged Facebook post goes through a legal process, and so far, ten posts were restricted in Thailand in response to requests from the Ministry of Information and Communication Technology. Last November the Thai government met with Mark Zuckerberg, the CEO of Facebook, to “discuss ways of monitoring and blocking ‘inappropriate content’,” DPA reported. This isn’t the first time Facebook has denied people access to certain content before. From July to December of 2015 Facebook has blocked 55,000 pieces of content within 20 different countries.